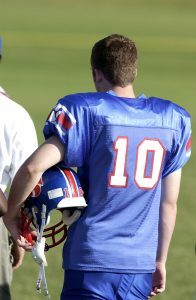 Will football players soon take medicine to prevent brain damage? I recently had the honor of talking to Dr. Ann McKee for a book I am writing. Dr. McKee is a leading neuropathologist and expert on CTE. She and her team perform autopsies and examine the brains of deceased athletes and members of the military, looking for changes consistent with the degenerative brain condition. While we mainly talked about CTE and football, I ended our discussion by asking her about an intriguing new study. She shared her thoughts on a “concussion pill” tested on mice and its implications for humans. That study and her thoughts make up my latest newspaper column. Finally there might be good news for football in terms of brain injuries. 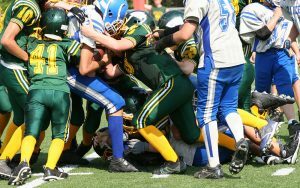 Earlier this week, the MIT Technology Review announced that researchers at the Harvard Medical School found a link between head trauma and the development of the degenerative brain condition chronic traumatic encephalopathy (CTE). The findings offer hope that doctors can one day identify players who might develop CTE but also prevent it before cognitive issues arise. The study, funded by the National Institutes of Health, the Alzheimer’s Association and the NFL Players Association, identified an abnormal protein that appears in the brains of mice shortly after head trauma. That protein proved to be a precursor to neurofibrillary tangles – clumps of tau protein found in the brains of deceased patients with CTE. Currently these neurofibrillary tangles can only be found by autopsy after an athlete dies. Given that a large percentage of football players suffer concussions or have repetitive blows to the head and don’t ever develop CTE, identifying those players likely to develop the condition before symptoms arise is crucial. This new protein might be a start. Since this protein appears soon after a head injury, doctors might one day be able to test for it with radiology scans or blood work. If a player tested positive, doctors could hold him out of football to protect him from further trauma. More importantly, doctors might be able to treat that athlete and prevent the brain deterioration seen in CTE. Lead researcher Kun Ping Lu and his team created antibodies to the protein and gave half of the traumatized mice those antibodies and nothing to the other half. The mice who suffered the brain trauma but were not given antibodies showed progressive risk-taking behaviors, much like athletes who prove to have advanced-stage CTE. The mice that received the antibodies did not develop that abnormal behavior. According to the MIT Technology Review article, Lu and his team aim to make a form of that antibody for humans. Then if a player tested positive for that protein after a head injury, he could take that medication and possibly prevent brain damage. I recently talked to Dr. Ann McKee, the chief neuropathologist for the Center for the Study of Traumatic Encephalopathy. She urged caution when I asked her about a pill to one day treat concussions. She pointed out how it’s common in medical research to find that treatments that work when tested on mice fail to work on humans. Humans have much more sophisticated brains than mice, and we get much more complicated diseases, like CTE. The CSTE has studied more brains of deceased football players than any center in the United States. Dr. McKee told me that she and her team just compiled their data on CTE found in the brains of former football players. They found brain changes consistent with CTE in 87 of 91 former NFL players, 7 of 9 semi-pro players, 26 of 32 college FB players and 7 of 24 high school athletes. Such numbers remind us that we have a long way to go. We need to clarify the role of genetics and other factors that cause some players to get CTE while others don’t. We must figure out the role that repetitive blows to the head – like what offensive and defensive linemen absorb over and over – play in CTE and what we can do to limit impacts to the brain. And we need to find a treatment for players whose mental and emotional functions decline. 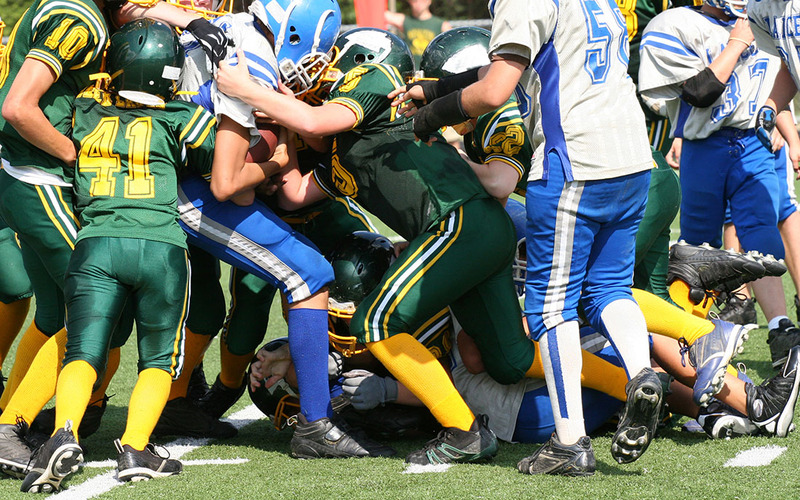 Do parents understand concussions and their importance? Maybe a medication based on tau antibodies will prove to be a breakthrough for future football players, and maybe it won’t. It has at least given football a glimpse of hope. Note: A modified version of this article appears as my sports medicine column in the August 6, 2015 issue of The Post and Courier. A concussion pill could prevent brain damage in football players. By Mike Orcutt. MIT Technology Review. July 22, 2015. Should we ban kids under age 18 from playing football?